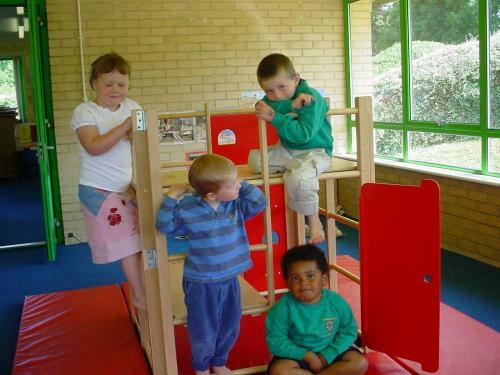 Children at the Kindergarten at the British School in Wotton-under-Edge have been enjoying new play equipment. Two new climbing frames, which can be linked together, and a slide are now taking pride of place in the new extension, which was built last year. "The equipment cost £870," said the Kindergarten Chairperson, Mrs Sue Keen. "All that money was raised by the fantastic efforts of the parents and staff, for which we are really grateful. It’s wonderful that we can offer the children such a marvellous range of both indoor and outdoor play, while also preparing them for school". This week the children from the Kindergarten, who are due to start school in September, will have the opportunity to spend some time in Reception class. "With the Kindergarten right next door to the infants, the children are already familiar with the layout, they have sessions in the library and IT suite and we find that come September they are confident and happy when they start school" said Mrs Rosemary Gotts, the Kindergarten leader. "The Kindergarten is increasing in popularity all the time" adds Mrs Keen. "This is partly due to our recent excellent OFSTED inspection, but also because the children have such great facilities and opportunities here. We are now taking on children for September, but places are going fast, so we are urging parents whose children will be three in the Autumn term to get in touch with us soon if they want to book sessions. Many people don’t realise that some pre-school is free, but if they contact us we can let them have all the details." There is also a session on Thursday afternoons at the Kindergarten, called "Tyggers" at which children aged 2 years can use the rooms and play equipment while accompanied by a parent or carer, which helps to prepare them for Kindergarten. And on Friday afternoons, parents/carers and toddlers get together for "Pooh Corner", a chance for very young children to interact and for mums, dads or carers to have a chat. For more information about the Kindergarten, or any other pre-school activities at the British School, please contact Mrs Sue Keen on 01453 843371.